Plastic cases have truly come a long way in recent years. No longer are these enclosures simply regarded as accessories for electronics and handheld devices. In fact, todays plastic cases are designed for optimal performance and functionality. No truer is this then when it comes to housing products, along with securing devices and even desktop units. As an industry-leader in plastic housings, SIMCO continues to create innovative and cutting-edge enclosures for all clients and industries. From plastic prototype to production, they have the tools and expertise to meet all customer needs within time and budget. 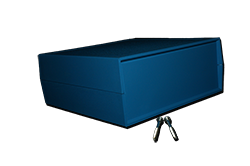 From small products and handhelds to desktop enclosures, their ABS boxes are RoHs and Reach compliant, ensuring the highest grades of plastic with sturdy and durable 94Hb and 94VO materials. Plastic Enclosures available with wall mounting tabs, PC board mounting bosses, battery access, screw-free potting boxes. Plastic Handheld Enclosures-perfect for devices with remote control housings, battery access, PC boards, and cases. Easy ordering options at the site-customized orders for companies and clients wishing to secure brand integration. SIMCO also features the largest inventory of tooling accessories for DIY applications. When it comes to injection molds, it is vital to keep these tooling units in good condition. This allows you to mold the best products you can for your electronics, products, and even desktop accessories. With precise and concise injection molding-you can secure maximum mold contouring for all your items and accessories. While this is mainly for clients and brands that want to customize DIY options- we already feature a myriad of existing cases and enclosures for all your needs. Simply browse our extensive online gallery and choose from a wide array of plastic housings, moldings, cases, and more. As your premier ABS plastic enclosure specialists, we guarantee the most sturdiest and long-lasting products for all customers. For more information, visit our site today and get the results you deserve!